Meals on Wheels - 20-24 July - Thanks to those who have volunteered. See Club Calendar. Link to travel programme and accommodation for Seoul Convention 2016 (Thanks to Keith Day). Link to travel programme and accommodation for Seoul Convention 2016 (Thanks to Takapuna President Youngshin Watkins). Link to an email about the appointment of the District Governor Nominee. 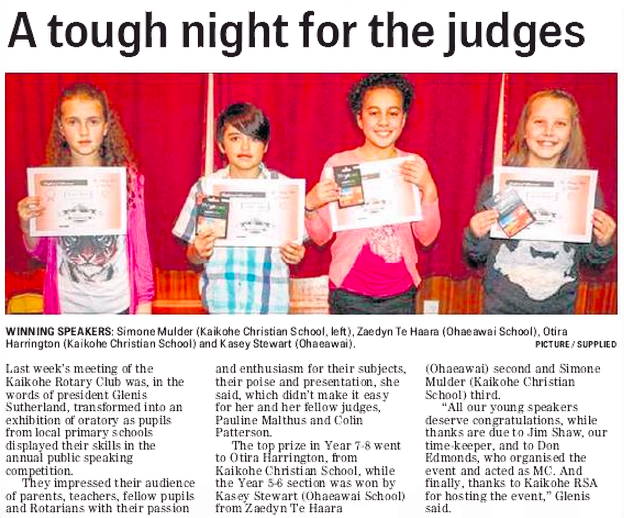 Link to Northland Age: A Tough Night for the Judges. Link to Developing Kaikohe as a Cycle Friendly Town consultation document. Bay of Islands Vintage Railway - Fun Trivia Night - Saturday 19 September. Should be a great night out supporting a very worthwhile cause - and an opportunity to spread the word about the Okaihau Kaikohe Traverse. Link to Rotary Weekly - 17 July 2015. Link to Rotary Down Under - July 2015.